All looked reasonably promising at the start of the season as the Star secured first place in the League Cup group section with four wins out of four against Arniston Rangers and Dalkeith Thistle with plenty of goals. There was also a league win over Bonnyrigg Rose. The only blip was a 1-0 defeat at home to Fauldhouse United, the only win the men from West Lothian would achieve in the league all season. The Star lost out in the quarter-final of the League Cup to Whitburn and lost 3-1 to Arniston Rangers in the league. Soon after the Star also exited the Scottish Junior Cup as the team lost to a last minute winner in the second round away to Kilsyth Rangers. This result and the poor recent form led to the departure of Ronnie Tolmie after only a few months in charge. Willie Garner took over as manager and he led the team to a fourth place in the league, only four points away from top spot. The Star may have finished just short, but the climax to the league was one of the most exciting in years. Linlithgow Rose met Whitburn in the final match. The winner would take the title. However, if the match ended in a draw then the title would go to Arniston Rangers. In the end Whitburn prevailed. In addition to the League Cup, there were two other cup quarter-final appearances in another largely disappointing season. For a team accustomed to winning trophies, such lack of progress was frustrating. The season did mark the testimonial year for three Star stalwarts - Gordon Fraser, Tony O'Hara and Paul Ramsay. Although, there was sad news in January when the death of former Star player Bobby Flavell was announced aged only 39. 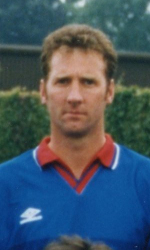 Bobby was your typical journeyman footballer, playing for a diverse range of clubs such as Halifax Town, Barnsley, Vasteras SK in Sweden, Hibs, Motherwell and Berwick Rangers before he ended up at the Star. Armadale Thistle H 1 2 Samuel Hogarth, Davidson, Fraser, Affleck, Aitchison, O'Hara, Cochrane, Samuel, Bailey, P. Thomson, Ramsay. Subs: Ballantyne, MacLaren, Rennie, J. Thomson, Neilson. A 1 2 Cochrane Hogarth, Davidson, Fraser, Affleck, Aitchison, Reed, Cochrane, Samuel, Brock, Dall, O'Hara. Subs: Buchan, J. Thomson, P. Thomson, Rennie, Carswell. Arniston Rangers H 1 1 O'Hara Hogarth, Davidson, Fraser, Affleck, Aitchison, O'Hara, P. Thomson, Samuel, Brock, Ramsay, Dall. Subs: Buchan (for Brock), Rennie, Bailey (for Dall), Cochrane (for Davidson), Neilson. A 1 3 O'Hara Hogarth, Miller, Fraser, Affleck, Aitchison, P. Thomson, Buchan, Samuel, Bailey, Ramsay, O'Hara. Subs: Reed, Cochrane, Davidson, Neil, Carswell. Bo'ness United H 1 2 Samuel Hogarth, Davidson, Fraser, Affleck, Aitchison, Miller, Cochrane, P. Thomson, Ramsay, Samuel, Reed. Subs: Dall (for Miller), O'Hara, Ballantyne, J. Thomson, Carswell. A 1 0 Brock Hogarth, Davidson, Fraser, Affleck, Aitchison, O'Hara, Cochrane, Samuel, Buchan, Bailey, Dall. Subs: Brock, Ramsay, J. Thomson. Bonnyrigg Rose H 3 2 Bailey 3 Hogarth, Davidson, Reed, Fraser, Aitchison, O'Hara, Cochrane, Samuel, Bailey, Ramsay, Dall. Subs: J. Thomson (for Reed), Buchan, Rennie, P. Thomson, Carswell. Camelon Juniors H 4 1 Bailey, Samuel, Brock 2 Hogarth, Davidson, Reed, Affleck, Aitchison, O'Hara, Cochrane, Samuel, Bailey, Ballantyne, Ramsay. Subs: Brock (for Bailey), P. Thomson (for Ballantyne), Buchan, J. Thomson, Carswell. A 2 1 Samuel, Cochrane Hogarth, Miller, Fraser, Affleck, Aitchison, Cochrane, O'Hara, P. Thomson, Ramsay, Samuel, Ballantyne. Subs: Buchan, Davidson, Neil, J. Thomson, Carswell. Dunbar United H 3 1 Ramsay, Samuel, Reed Hogarth, Davidson, Reed, Affleck, Aitchison, Miller, Cochrane, Samuel, Ramsay, Ballantyne, Dall. Subs: Buchan, Carswell. A 2 2 Bailey, Ramsay Hogarth, Davidson, Reed, Affleck, Rennie, O'Hara, Cochrane, Samuel, Brock, Bailey, P. Thomson. Subs: Buchan, Ramsay, J. Thomson, Fraser, Dall. A 5 0 Ramsay, Cochrane, Samuel, Buchan, Bailey Hogarth, Davidson, Reed, Affleck, Aitchison, Cochrane, Buchan, O'Hara, Ramsay, Samuel, Bailey. Subs: Dall, J. Thomson, Perry, Fraser, P. Thomson. Harthill Royal H 1 1 Samuel Hogarth, Miller, Fraser, Affleck, Aitchison, Cochrane, O'Hara, P. Thomson, Ramsay, Samuel, Ballantyne. Subs: Buchan, Davidson, Neil, Reed, Carswell. Linlithgow Rose H 2 1 Samuel 2 Hogarth, Davidson, Fraser, Affleck, Aitchison, O'Hara, Cochrane, Samuel, Bailey, Ramsay, Dall. Subs: Brock (for Ramsay), Ballantyne (for Fraser), Buchan, Rennie, Carswell. A 1 1 Dall Carswell, Davidson, Fraser, Rennie, Aitchison, Affleck, Cochrane, Samuel, O'Hara, J. Thomson, Dall. Subs: P. Thomson (for Rennie). Ormiston Primrose H 3 0 Samuel, Bailey, Davidson Hogarth, Davidson, Fraser, Affleck, Aitchison, O'Hara, Cochrane, Samuel, Buchan, Bailey, Dall. Sub: Brock (for Dall), Rennie, J. Thomson, P. Thomson, Carswell. A 1 0 Ramsay Hogarth, Davidson, Reed, Fraser, Aitchison, Cochrane, Buchan, P. Thomson, Ramsay, Samuel, Ballantyne. Subs: Affleck, O'Hara, Dall, Miller, Carswell. Whitburn Juniors H 0 1 Russell, MacLaren, Fraser, Affleck, P. Thomson, O'Hara, Cochrane, Samuel, Brock, Ramsay, Ballantyne. Subs: Buchan (for Ballantyne), Davidson, Bailey (for Ramsay), J. Thomson. 2 A Kilsyth Rangers 1 2 Ramsay Hogarth, Davidson, Fraser, Neil, Aitchison, Miller, Cochrane, Samuel, Ramsay, Ballantyne, Dall. Subs: Buchan, O'Hara, J. Thomson, Bailey, Carswell. 2 A Haddington Athletic 0 2 Hogarth, Davidson, Fraser, Cochrane, Aitchison, Reed, Buchan, O'Hara, Ramsay, Ballantyne, Samuel. Subs: Affleck, J. Thomson, Neil, Carswell. 1 H Harthill Royal 5 1 Samuel 2, Reed, Dall, Cochrane Hogarth, Davidson, Reed, Fraser, Aitchison, Cochrane, Dall, P. Thomson, Ramsay, Samuel, Ballantyne. Subs: Buchan (for Dall), Miller (for Cochrane). 2 H Blackburn United 4 0 Bailey 3, Samuel Hogarth, Davidson, Fraser, Affleck, Aitchison, O'Hara, Cochrane, Samuel, Bailey, Ramsay, Ballantyne. Subs: Adams (for Bailey), Dall (for Davidson), Reed (for Fraser), J. Thomson, Buchan. QF H Linlithgow Rose 0 0 Hogarth, Davidson, Fraser, Affleck, P. Thomson, O'Hara, Cochrane, Samuel, Ramsay, Ballantyne, Dall. Subs: Buchan (for Ballantyne), Bailey (for Dall). 1 H Musselburgh Athletic 5 0 Ramsay 2, Reed, Samuel, Cochrane Hogarth, Davidson, Reed, Affleck, Aitchison, Cochrane, Buchan, O'Hara, Ramsay, Ballantyne, Samuel. Subs: J. Thomson, Dall, Bailey, Fraser, Carswell. 2 A Armadale Thistle 2 1 Samuel 2 Hogarth, Davidson, Reed, Affleck, Aitchison, Cochrane, Buchan, Samuel, Bailey, Ramsay, O'Hara. Subs: J. Thomson, P. Thomson, Dall, Ballantyne. QF H Bonnybridge Juniors 0 1 Hogarth, Davidson, Fraser, Affleck, Aitchison, Buchan, Cochrane, Samuel, Ramsay, Ballantyne, Dall. Subs: J. Thomson, Rennie. Arniston Rangers H 5 0 Bailey 2, O'Hara, P. Thomson, Reed Russell, Davidson, Fraser, J. Thomson, Aitchison, Cochrane, Buchan, P. Thomson, Bailey, Ballantyne, O'Hara. Subs: Dall (for Buchan), Reed (for Ballantyne), Miller, Carswell. Dalkeith Thistle H 6 1 Aitchison, Ramsay 2, Robertson 2, P. Thomson Hogarth, Davidson, Reed, Fraser, Aitchison, Miller, Cochrane, P.Thomson, Ramsay, Ballantyne, Dall. Subs: J. Thomson, O'Hara, Robertson, Carswell. QF H Whitburn Juniors 1 1 P. Thomson Hogarth, Davidson, Reed, Fraser, Aitchison, Cochrane, O'Hara, P. Thomson, Ramsay, Samuel, Ballantyne. Sub: Miller (for Cochrane), Buchan, J. Thomson, Affleck, Carswell. A Whitburn Juniors 0 1 Hogarth, Miller, Fraser, Affleck, Aitchison, Cochrane, Ramsay, P. Thomson, Bailey, Samuel, Ballantyne. Subs: Buchan, Davidson, O'Hara.